I was intrigued by the piece on the latest episode of "Fully Charged"
talking about Electric Aircraft, and how Easy Jet says it could be flying electric planes within a decade. I was then directed to this episode of "Fully Charged" which was exclusively about a company designing an electric aircraft for the likes of the Red Bull Air Races. Fascinating stuff. I know electric aircraft are on the go elsewhere, but this is being designed and built by Brits. Look forward to watching the progress of this aspect of EVs. 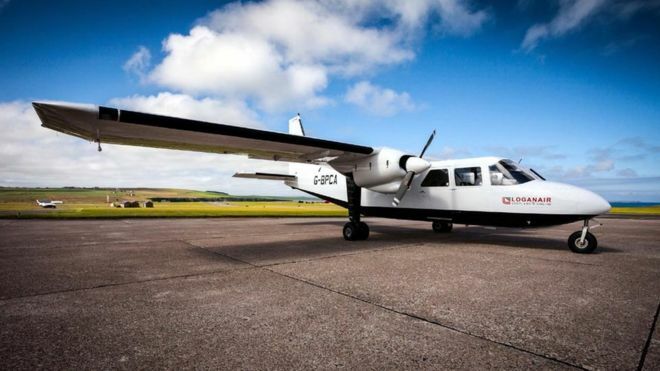 Loganair are looking at the possibility of using an electric aircraft on the short flights between the Orkney Islands. They would use a modified Islander instead of a newly developed model. They hope to be running by 2021. Should be quite interesting to see what the locals think of this when we go back up next year. Other half and eldest used the plane to pop into Kirkwall when we were up there in August, and there was no sniff of this back then. The 9-10 minute flight (12 minutes scheduled) replaces a 1 hour 40 minute ferry ride, longer if the ferry has to call elsewhere. Despite the difficulties of living on the outlying North Isles, they are a very forward looking community and usually embrace this sort of thing. I guess the inverted commas in the item's headline conveys a degree of scepticism from this respected aviation source ! The "progress" appears to be that they've applied for a patent, and may or may not be experimenting with much smaller aircraft. At present state of battery technology aviation fuel contains 98% more energy than the equivalent weight of batteries. The conversion of electricity into motion is a bit more efficient than conversion of fuel into motion but you can see the scale of the problem - in vehicles the weight of the batteries is important but not a deal breaker, in aircraft the weight of the batteries is super-important and is a deal breaker. Payload is ultra important on a plane to make them viable, no good having a plane the size of a 737 that can only carry 40 people because of the weight of the batteries - short hops with light loads seems to be the immediate future of EA. Having this debate with someone elsewhere. He was arguing for hybrid to relieve range anxiety. My issue with that was you then have to carry on board two different types of engine, two fuel sources and all the associated architecture that entails. The other challenge is how long the airliner spends on the apron being charged and not generating income. I think electric propulsion for flight is a lot further away than it is for other forms of transport, other than for small aircraft for 3 or 4 passengers. Autonomous for flight is much nearer though, given it faces few of the technical challenges that self driving cars do, and really only faces the most basic question of passenger trust. Autonomous flight has been around for quite a while, planes are more than capable of taking off, cruising at altitude and hitting waypoints, and landing automatically in fog or darkness. Problem is that when aircraft do have problems due to sensor or any other failure the pilot's and crew seem pretty much incapable of taking over control - if you want some examples of the problems crew get into and crash perfectly serviceable aircraft with massive loss of life watch ' air crash investigators ' series on tv, it is truly frightening how simple problems turn into nightmares. Modern pilots are highly trained in looking after the computers, but woefully badly prepared to deal with the aircraft once autopilot has disconnected itself due to system malfunctions. As one investigator explained it, pilots are not taught the basics of aircraft handling anymore, and there are no laybys in the sky. Another thing is, as a normal aircraft flies its fuel load gets lighter and it takes less energy to keep the plane in the air - this does not happen with a battery - so you land with the same load you took off with. Also the safe landing weight of an aircraft is normally a lot lighter than its max take-off weight, that is why planes often have to jettison expensive fuel if they have to land early for any reason.